A deli is a popular restaurant with a limited menu that features sandwiches, soups, chilis and chowders, salads, and other menu items that are freshly and quickly made. Many customers visit delis when they are in a hurry because they know that the food will be prepared quickly and efficiently. If your kitchen is struggling to catch up with fulfilling orders, consider implementing these five simple tips for improving the speed at which food is prepared in your deli. These simple tips will help satisfy even the most harried customer. One of the simplest ways to make food preparation a little quicker is to pre-slice and prearrange sandwich ingredients. When meat, cheese, tomatoes, onion, and lettuce are ready to go, the process of creating and assembling a sandwich is much simpler. Different stations for different food preparation and cooking tasks can make the prep process go much more quickly. Assign different employees to man different stations such as the stove, the sandwich prep table, and the plate assembly station. An efficient ordering system can dramatically improve the speed at which food is made and served. Many delis use an order carousel or order holders to display orders to the cooking staff. You may also choose to invest in an electronic system that uses monitors to display orders to your deli employees. Another way to improve the speed at which orders are delivered is to send food out immediately after it is prepared rather than wait to group completed orders together. If, for example, several business associates visit your deli together, you can send sandwiches and salads out as they are completed, rather than try to deliver the entire table's food at once. 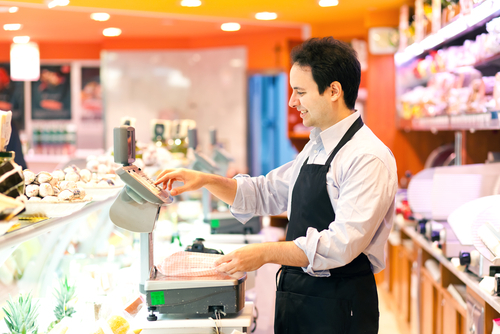 Some customers who visit your deli may not be in a rush. They may be willing to take their time at lunch or dinner, visit with friends, and wait patiently for their favorite sandwich or menu item. However, you will have customers who will visit your deli specifically because they are looking for something fast. You can please these customers by creating a quick menu that lists the sandwiches that can be made in a very short period of time. Sandwiches, like chicken salad or tuna salad sandwiches, that are pre-made are great for a quick menu list. Avoid hot sandwiches or sandwiches that take a long time to assemble and prepare. You can also create a special of the day for your delicatessen such as soup, chowder, or even a hot sandwich that can be prepared very quickly on that specific day. Make sure that all the ingredients for your daily special are easily accessible, and put one cook in charge of making only the special to ensure that these items are created quickly. A delicatessen is known for being a fast-paced, hectic environment. Many consumers will drop into your deli because they need a sandwich on the go, and so it is your responsibility to ensure that these customers get their food in a timely fashion.